La Pelegrina wurde von einem Sklaven in Panama im 17. Jahrhundert gefunden,kam dann an Philip IV von Spanien, der gab sie seiner Tochter Marie-Thérèse 1660 zur Hochzeit mit Ludwig XIV. von Frankreich. 1792, nach dem Ende der Bourbonen Monarchie verschwand die Perle und taucht 1826 in Moskau wieder auf. Prinzessin Tatiana Youssoupov, Urgroßmutter Zenaïdes kaufte das Juwel. Sie verschwand noch einmal während der russischen Revolution. Der Sohn Zenaïdes, Prinz Felix Youssoupov (der Mann, der Rasputin ermordete), schmuggelte zahlreiche Juwele aus Rußland, als er flüchtete. Im Exil in Paris konnte Felix und seine Frau Irina, duch den Verkauf der Juwelen gut leben. Die schwarzen Perlen Catherina der Grossen, der Polar Stern, der Sultan von Marokko und die Ohrringe von Marie-Antoinette der Königin von Frankreich wechselten dadurch ihren Besitzer, Warscheinlich wurde 1953, La Pelegrina ebenfalls veräussert, während er andere Preziosen noch behielt. Jedenfalls wurde die Perle nicht mit Hunderten anderer Juwelen in den geheimen Räumen des Labyrinths an der Moika, dem Youssoupovs Palast,versteckt. Dieses Depot blieb bis 1925 versteckt, bis die Soviets mit einer Erneuerung des neoklassischen Wohnsitzes begannen. Aus einem geheimen Raum unterhalb des imposanten Treppenhauses, holten Arbeiter mehr als 250 Diamantbroschen, Berge von Armbänder und mehr als ein Dutzend Tiaras hervor, eingepackt in die Leiber von silbernen Schwänen, in Orginalgrösse von Faberge. La Pelegrina wurde nicht als Teil dieses Schatzes erwähnt bis 1987, als Christies die Perle auf der Auktion in Genf für $464.000 verkaufte. La Pelegrina belonged to King Philip IV and he gave it to his daughter Maria Teresa when she married Louis XIV of France in 1660. However, there is no document to confirm that this pearl was among the French royal jewels. The pearl appeared again in 1826 in the Yusupov (= Youssoupov) collection. 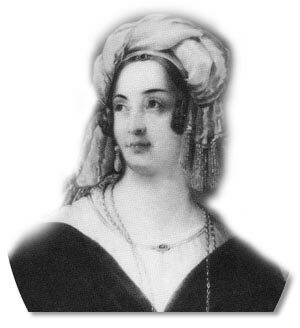 Princess Tatiana Youssoupov (1769-1841) who owned it since 1826 was the niece to Potemkin, the favourite of Catherine II and had a passionate taste for jewellery and started a collection which soon became famous. She bought the "Polar Star" Diamond and several parures which came from the French crown, frome the Queen of Naples and, lastly the unique and splendid Pelegrina. The latter she wore as a single ear-pendant (see the picture left). In the second half of the 19th centruy Princess Zenaida Youssoupov, mother of Prince Felix Youssoupov, is documented to have worn the pearl hanging from a long sautoir, like this on the painting on top. She wore the 111-grain silver pearl ("The Incomparable"), to Queen Victoria’s coronation. After the Russian Revolution most of the jewellery collection of the Youssoupov family was discovered in a cache in their Moscow Palace by the Bolsheviks. Fortunately, the pearls, the PELEGRINA among them, had already been smuggled out of Russia, together with such diamonds as the "Polar Star", the "Sultan of Morocco" the "Ram`s Head" and a pair of diamond ear-pendants which had previously belonged to Marie-Antoinette. Cartier London bought all the pearls in 1934 with exception oft the Pelegrina, which Prince Felix could not bear to part with. Only in 1953 did he sell it to Jean Lombard, the Geneva based jewelller with close connections to the Russian nobilty. Lombard in turn sold it to a European collector. In the early 19th century the name PELEGRINA had been given to a spherical pearl with a weiht of 111 1/2 grains. Centuries later Boucheron London wrote to Prince Youssouov about the Pelegrina Pearl : This pearl is certainly very rare, one could say unique. It really is alive and carries a distinctly pink hue. It is as much the pearl`s lustrous shin as its shape which gives the pelegrina its value beyond compare. Also from the French Crown jewels acquired - via the jeweller Faberge - the "La Regente" Pearl of 337 grains, in the picture above, Zenaide wore the La Pelegrina and the Regent Pearl as a hair-jewel. And in the second picture on a sautoir as pendant, more about the story of the Regent Pearl at the website of Queen Eugenie of France. These pearls together with La PELEGRINA, the Black Azra Pearl and an oustanding black pearl necklace formed part of one of the most astonishing collections of pearls ever assembled. The Pelegrina was exhibited in London in 1935 . In may 1987 it was sold in auction in Christies (of Genevre). It reached the sum of 682.000 Swiss francs, more or less 380.000 $.